The world of darkness hides many secrets beyond the veil. We mere mortals like to think we have a clue about what goes on in the shadows, but it is only a few assumptions that we grasp onto in hopes that we have a chance to defend ourselves. But, the most tragic mistake the mortal world can make is to believe those silly conclusions about the supernatural world. It lets us look at film or common convention and assume that one mystical monster is vulnerable to this or that so we can wander into the darkness, full of confidence that they know everything to be said about the world of darkness… only to never return! Imagine the Vampire Lord, for example. We’ve got a pretty clear depiction: a mighty man of mysterious power who can look into your eyes and command you to do all that he wants. He might take the form of a bat or wolf at his whim or even puff into mist to sneak his way into your home. Oh, no, he couldn’t do that until he was invited and, even then, a simple ward of garlic and you’re safe, right? But that’s the real trick! The Vampire Lord isn’t the master of the undead at all. You know the truth, thanks to the charming eye of your tyke who has convinced you to find this elegant Vampire costume! 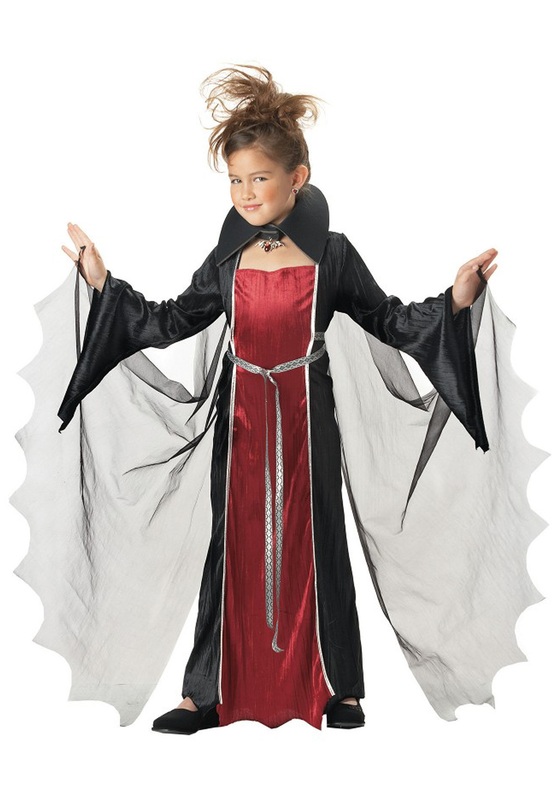 The black and maroon fabric is regal, even more when your lordly kiddo waves their undead arms and fans out these knit mesh wings with finger loops! The silver-tone bat charm and its vivid red faux gem clearly possess some serious magical mojo, but nothing nearly as potent as the smile your Vampirelet is going to give once a few mortal victims gasp in surprise at the true ruler of the darkness!